It’s the weekend! Maybe you have a little time to pop some brownies into the oven. MoFo’ers have been baking up batches all week. Scratch and Sniff muses on her grandmother and brownies and her grandmother’s brownies. Vegan Thyme bakes up one of my favorite combos: Chocolate Ginger Brownies, from Robin Robertson’s new cookbook. There’s an amazing looking recipe for Raw Fudge Brownies at the end of this dinner party post at Soap & Chocolate. And yet another Raw Brownie recipe at Fashion Peace. Chocolate not your thing? Think blondes have more fun? How about these White Chocolate Peanut Butter Blondies at Bjorked Off. 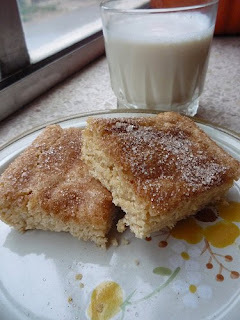 Or a very cool idea for Snickerdoodle Blondies at Flour Riot. Can’t wait to see what youse bake up over the weekend! I saw those raw brownies! They looked amazing. . . .
Hi K! I’m not sure why my blog isn’t working for you. Try going to the main page: http://flourriot.blogspot.com/ and finding the blondies on the recipe list on the right-hand side.